When I was a new gardener, the only way to get a creamy white head of cauliflower was to wait until the outer leaves were long, and then tie them up over the developing heads. This blanches the curds so they stay white. Nowadays, cauliflower not only grows leaves long enough to cover the head, but the leaves will arch over and start the blanching process all by themselves. Cauliflower is one of those rewarding vegetables that grow with very little effort from the gardener. It develops best in the cool spring or fall months. Cauliflower plants should be available at garden centers for spring planting in many areas and for fall planting where winters are mild. Cauliflower is a cool-season vegetable that dislikes heat and humidity. You can raise a crop of cauliflower by raising your own setout plants. 4-6 weeks before last frost in spring or before first frost in fall. Soil temperature – 80 degrees F.
1/4 inch to 1/8 inch deep. Put started plants outdoors in good garden soil, about a foot apart. Keep the soil moist. Wrap the stems of the plants, from below the leafy top to just under the soil surface, with strips of paper or aluminum foil to thwart cutworms. Cauliflower needs consistent water and fertilizer. A little shade for late summer plants will be appreciated. To keep cauliflower on your table for several weeks, be sure to plant different varieties that will mature in different numbers of days. Some take only 55 days while others can take up to 80. Romanesco is a funky looking hybrid that resembles stacked seashells. It is pretty enough to use as a centerpiece and looks good “green” so it needs no garden blanching. Rambunctious little boys might be willing to try the white curds of “normal” cauliflower if you call them brains. 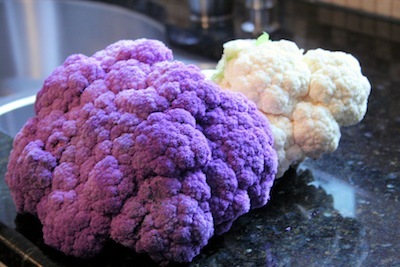 Girlie girls might prefer their cauliflower in deep purple, which turns to pale lavender when cooked. There is also a deep yellow/gold form called Cheddar. Some people with diabetes even use whipped cauliflower, with butter and a smidgeon of milk, as a passable replacement for mashed potatoes in their diet. I prefer my cauliflower with a melted cheese sauce. I find it to have a milder flavor than broccoli. Cauliflower deserves more growing space in a vegetable garden, even if you only use it raw on a vegetable plate. Since our weather has become so unpredictable of late, look for varieties developed to offer both cold and heat tolerance.